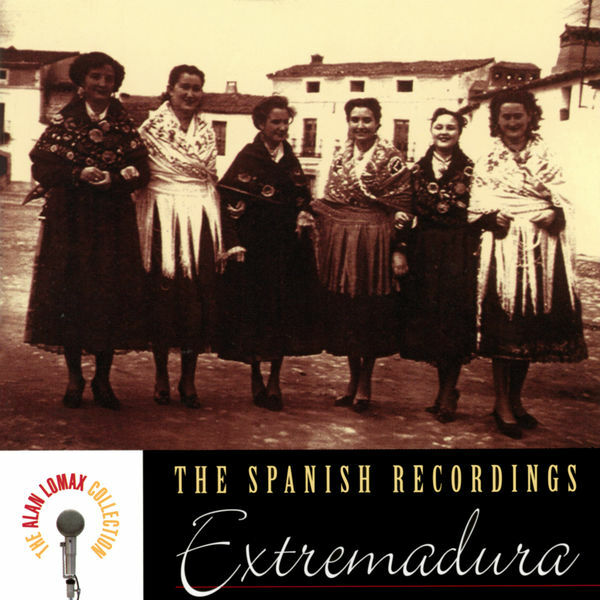 Traditional, ComposerLyricist - ALAN LOMAX, Producer, Recording Engineer, Recording Producer, StudioPersonnel - STEVE ROSENTHAL, Producer - Phil Klum, Mastering Engineer, StudioPersonnel - Matthew Barton, Production Coordinator, StudioPersonnel - Manuel García Matos, Flute, Tabor, MainArtist, AssociatedPerformer - Jeannette Bell, Asst. Recording Engineer, StudioPersonnel Copyright : ℗ 2002 The Association for Cultural Equity, under exclusive license to Rounder Records, a division of Concord Music Group, Inc. Traditional, ComposerLyricist - ALAN LOMAX, Producer, Recording Engineer, Recording Producer, StudioPersonnel - STEVE ROSENTHAL, Producer - Unknown Artist, Tambourine, AssociatedPerformer - Phil Klum, Mastering Engineer, StudioPersonnel - Matthew Barton, Production Coordinator, StudioPersonnel - Jeannette Bell, Asst. Recording Engineer, StudioPersonnel - Domitila Parra, Vocals, MainArtist, AssociatedPerformer - Visitación Jorna, Vocals, MainArtist, AssociatedPerformer - Antónia Crespo, Vocals, MainArtist, AssociatedPerformer - María Parra Gil, Vocals, MainArtist, AssociatedPerformer - Filonila González, Vocals, MainArtist, AssociatedPerformer Copyright : ℗ 2002 The Association for Cultural Equity, under exclusive license to Rounder Records, a division of Concord Music Group, Inc. Traditional, ComposerLyricist - ALAN LOMAX, Producer, Recording Engineer, Recording Producer, StudioPersonnel - STEVE ROSENTHAL, Producer - Unknown Artist, MainArtist - Phil Klum, Mastering Engineer, StudioPersonnel - Matthew Barton, Production Coordinator, StudioPersonnel - Jeannette Bell, Asst. Recording Engineer, StudioPersonnel Copyright : ℗ 2002 The Association for Cultural Equity, under exclusive license to Rounder Records, a division of Concord Music Group, Inc. Traditional, ComposerLyricist - ALAN LOMAX, Producer, Recording Engineer, Recording Producer, StudioPersonnel - STEVE ROSENTHAL, Producer - Phil Klum, Mastering Engineer, StudioPersonnel - Matthew Barton, Production Coordinator, StudioPersonnel - Jeannette Bell, Asst. Recording Engineer, StudioPersonnel - Balbina Díaz Jiménez, Vocals, MainArtist, AssociatedPerformer - Marcelina Díaz Jiménez, Vocals, MainArtist, AssociatedPerformer - Cándida Parra, Vocals, MainArtist, AssociatedPerformer - Primitiva Amado Díaz, Vocals, MainArtist, AssociatedPerformer Copyright : ℗ 2002 The Association for Cultural Equity, under exclusive license to Rounder Records, a division of Concord Music Group, Inc. Traditional, ComposerLyricist - ALAN LOMAX, Producer, Recording Engineer, Recording Producer, StudioPersonnel - STEVE ROSENTHAL, Producer - Phil Klum, Mastering Engineer, StudioPersonnel - Matthew Barton, Production Coordinator, StudioPersonnel - Jose Canal, Vocals, MainArtist, AssociatedPerformer - Jeannette Bell, Asst. Recording Engineer, StudioPersonnel Copyright : ℗ 2002 The Association for Cultural Equity, under exclusive license to Rounder Records, a division of Concord Music Group, Inc. Traditional, ComposerLyricist - ALAN LOMAX, Producer, Recording Engineer, Recording Producer, StudioPersonnel - STEVE ROSENTHAL, Producer - Phil Klum, Mastering Engineer, StudioPersonnel - Matthew Barton, Production Coordinator, StudioPersonnel - Jeannette Bell, Asst. Recording Engineer, StudioPersonnel - Francesca Díaz, Vocals, MainArtist, AssociatedPerformer Copyright : ℗ 2002 The Association for Cultural Equity, under exclusive license to Rounder Records, a division of Concord Music Group, Inc. Traditional, ComposerLyricist - ALAN LOMAX, Producer, Recording Engineer, Recording Producer, StudioPersonnel - STEVE ROSENTHAL, Producer - Phil Klum, Mastering Engineer, StudioPersonnel - Matthew Barton, Production Coordinator, StudioPersonnel - Jeannette Bell, Asst. Recording Engineer, StudioPersonnel - Juan Campo Barquillas, Vocals, MainArtist, AssociatedPerformer Copyright : ℗ 2002 The Association for Cultural Equity, under exclusive license to Rounder Records, a division of Concord Music Group, Inc. Traditional, ComposerLyricist - ALAN LOMAX, Producer, Recording Engineer, Recording Producer, StudioPersonnel - STEVE ROSENTHAL, Producer - Phil Klum, Mastering Engineer, StudioPersonnel - Matthew Barton, Production Coordinator, StudioPersonnel - Jeannette Bell, Asst. Recording Engineer, StudioPersonnel - Marcelina Díaz Jiménez, Vocals, MainArtist, AssociatedPerformer Copyright : ℗ 2002 The Association for Cultural Equity, under exclusive license to Rounder Records, a division of Concord Music Group, Inc. Traditional, ComposerLyricist - ALAN LOMAX, Producer, Recording Engineer, Recording Producer, StudioPersonnel - STEVE ROSENTHAL, Producer - Phil Klum, Mastering Engineer, StudioPersonnel - Matthew Barton, Production Coordinator, StudioPersonnel - Jeannette Bell, Asst. Recording Engineer, StudioPersonnel - Santiago Béjar, Flute, Tabor, MainArtist, AssociatedPerformer Copyright : ℗ 2002 The Association for Cultural Equity, under exclusive license to Rounder Records, a division of Concord Music Group, Inc. Traditional, ComposerLyricist - ALAN LOMAX, Producer, Recording Engineer, Recording Producer, StudioPersonnel - STEVE ROSENTHAL, Producer - Phil Klum, Mastering Engineer, StudioPersonnel - Matthew Barton, Production Coordinator, StudioPersonnel - Jeannette Bell, Asst. Recording Engineer, StudioPersonnel - Domitila Parra, Vocals, MainArtist, AssociatedPerformer - Visitación Jorna, Vocals, MainArtist, AssociatedPerformer - Antónia Crespo, Vocals, MainArtist, AssociatedPerformer - María Parra Gil, Vocals, MainArtist, AssociatedPerformer - Filonila González, Vocals, MainArtist, AssociatedPerformer Copyright : ℗ 2002 The Association for Cultural Equity, under exclusive license to Rounder Records, a division of Concord Music Group, Inc. Traditional, ComposerLyricist - ALAN LOMAX, Producer, Recording Engineer, Recording Producer, StudioPersonnel - STEVE ROSENTHAL, Producer - Phil Klum, Mastering Engineer, StudioPersonnel - Matthew Barton, Production Coordinator, StudioPersonnel - Jeannette Bell, Asst. Recording Engineer, StudioPersonnel - Asunció Borrequero Morales, Vocals, MainArtist, AssociatedPerformer Copyright : ℗ 2002 The Association for Cultural Equity, under exclusive license to Rounder Records, a division of Concord Music Group, Inc. Traditional, ComposerLyricist - ALAN LOMAX, Producer, Recording Engineer, Recording Producer, StudioPersonnel - STEVE ROSENTHAL, Producer - Phil Klum, Mastering Engineer, StudioPersonnel - Matthew Barton, Production Coordinator, StudioPersonnel - Jeannette Bell, Asst. Recording Engineer, StudioPersonnel - Bernarda Mateos Sánchez, Vocals, MainArtist, AssociatedPerformer Copyright : ℗ 2002 The Association for Cultural Equity, under exclusive license to Rounder Records, a division of Concord Music Group, Inc. Traditional, ComposerLyricist - ALAN LOMAX, Producer, Recording Engineer, Recording Producer, StudioPersonnel - STEVE ROSENTHAL, Producer - Phil Klum, Mastering Engineer, StudioPersonnel - Matthew Barton, Production Coordinator, StudioPersonnel - Jeannette Bell, Asst. Recording Engineer, StudioPersonnel - Balbina Díaz Jiménez, Vocals, MainArtist, AssociatedPerformer - Cándida Parra, Vocals, MainArtist, AssociatedPerformer - Primitiva Amado Díaz, Vocals, MainArtist, AssociatedPerformer - Martelina Diaz Jiménez, Vocals, MainArtist, AssociatedPerformer Copyright : ℗ 2002 The Association for Cultural Equity, under exclusive license to Rounder Records, a division of Concord Music Group, Inc.
© © 2002 Rounder Records, a division of Concord Music Group, Inc.